I’m not a trained designer from one of the great Art Institutes around the country, but I design everyday. How? Often with Canva. With a constant stream of content publishing at many organizations, social media managers and writers are often called upon to be graphic artists, too. We build relationships online, but are also expected to have mad Photoshop skills. And even for developers, just because you’re a PHP and CSS ninja, doesn’t mean you also have the time to spend hours in photoshop to create a featured image of a post meant to highlight your services for hire. Because, as many of us know, we have another article due soon. If you’ve been writing for the last year and need images for your blog, you’ve probably heard of Canva. If you haven’t, go check them out (canva.com). I love Canva so much that I pay for their monthly service: Canva for Work. Seriously, this is the best thing that happened to content marketers since Buffer. 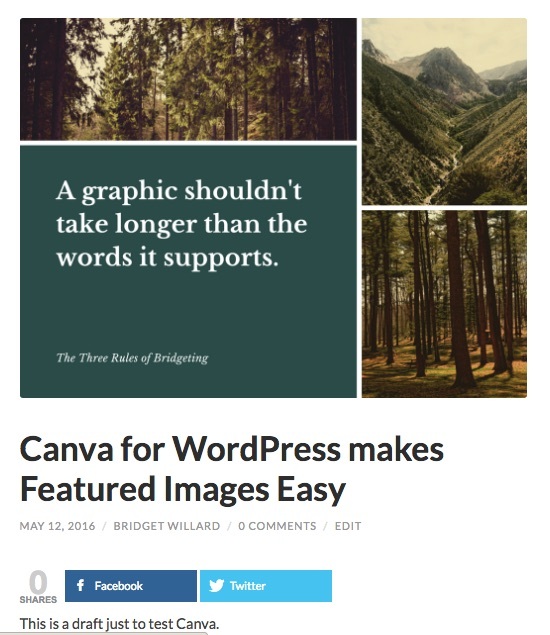 I have great news for those who are tired of posting featured-image-less articles, yet care about your workflow: Canva has a WordPress plugin. 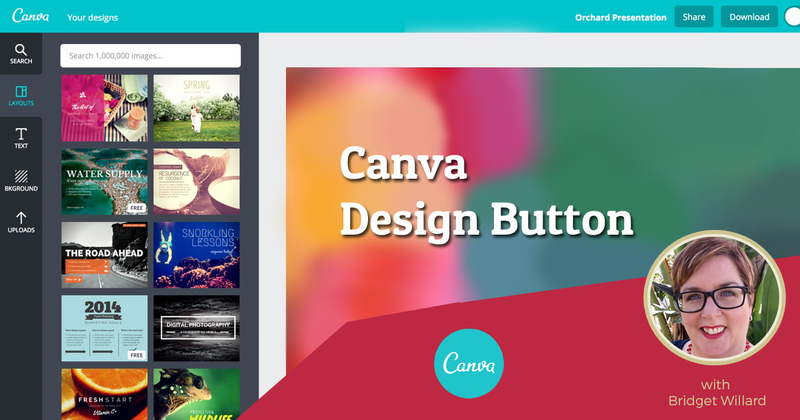 Whether you lack photoshop skills or need a more seamless workflow, the Canva Design Button is for you. Canva’s motto is “Empowering the World to Design” which pairs nicely with “Democratizing Publishing.” It’s not far-fetched to say that Canva plus WordPress is a match made in Internet Heaven. This plugin has over 1,000 active downloads but hasn’t been updated in two years. So, that’s a bit of a bummer. That said, I’m using WordPress 4.5.2 with the free theme Hemingway without any issue. That’s is the basic pattern with all plugins hosted in the WordPress Repository. However a blog graphic tends to be wide and tall, so I chose “presentation.” It’s too bad the button doesn’t have “blog title” as a default. 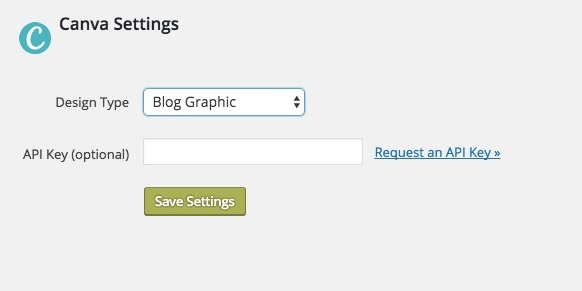 Canva’s settings default to Blog Graphic. 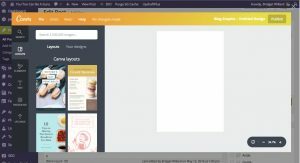 Again, if you’re familiar with Canva, you know that their pre-made sizes have names under “popular design types.” A blog graphic is wide and tall — specifically 800 x 1200 pixels. Of note is a collage (25cmx20cm), Facebook Ad (1200x268px), and Pinterest (735x1102px) graphic. Many bloggers who want to optimize their posts for Pinterest recommend including a long, skinny graphic for pinning. So this is perfect. The API is no longer available. There is an optional form field for an API key. It’s a good thing it’s optional because Canva is no longer accepting applications for an API key. However, if you’re logged into Canva in the same browser as your WP Dashboard, your image library is available. This means if you have a Canva for Work account, you have access to your logos and brand colors. The design button appears in the Editor. In order to use Canva, simply write a post in the WordPress Editor as you would normally. When you’re ready to insert an image, click the “Design in Canva” button to open up the Canva Pop up. Select your type of design. Canva will open in a pop up on top of your Editor. They have pre-made designs both free or for $1. Note that you can start with a blank canvas, too. You can choose from their elements, background images, icons, and photos. Just like the pre-made designs, some elements are free others are $1 each. You can also upload your own photo. After you’ve completed your design, click “Publish,” it will add the image into your post — and, more importantly — your media library. Did you want that image to be the featured image? Go down to your Featured Image metabox and choose the image you just created. 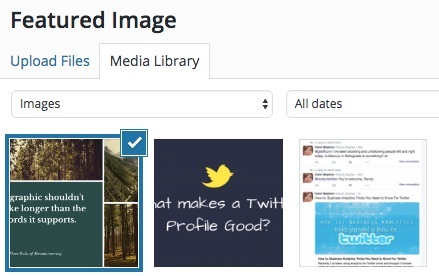 Canva adds your newly-created image into the media library. This is an important feature. The image is added to your Media Library. If you want to add another image, simply put your cursor in the editor where you want the new image to appear. Then click Design in Canva. If you want the image to be another size, choose File, change dimensions. If magic resize is available to you, you can use that, too. Even though “blog title” isn’t available as a default setting, it is available as an option through the size menu. Canva isn’t just for featured images. 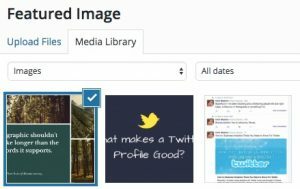 You can add multiple images with varying sizes in a single post. A few months ago, I reviewed ImageInject. At first glance it seems very similar to Canva. It’s not. Canva allows you to customize the image with filters, cropping, and text. ImageInject is a keyword-based search tool for Creative Commons images on Flickr and Pixabay. If customization isn’t important to you, ImageInject may be the best choice. This is the beauty of WordPress. You choose the plugins that perform the functions your website needs to accomplish its goals. The pros of using Canva inside your editor is two less tabs open, ability to save to the media library, and a seamless workflow. The disadvantage is that your image is not saved on Canva.com (if you like to copy and alter for another post). I often have to change my image and so I find myself editing in Canva.com. Also, for some of my blog posts, I keep the image similar so canva.com allows me to make a copy. 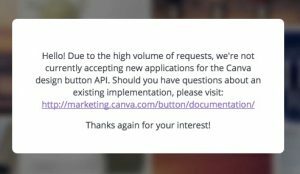 Canva Design Button’s lack of API and saving / editing is a deal-breaker for the way I work. Still, as far as a free plugin goes, this is a gem. You have options. This may be just what you’ve been looking for. So, what’s stopping you? Get to designing.